Eggs Benedict is my hands-down favorite breakfast meal of all time. Crepeville in Davis, California and Lazari in Vredehoek, Cape Town serve the best Eggs Benny on either side of the Atlantic and today I undertook the challenge of making it myself. Ty claimed that he did not like Eggs Benny, which was his usual assertion for any unfamiliar food, so I was doubly determined to successfully pull it off and convince him of its awesomeness. Whenever I cook a new dish, I always run frantically around the kitchen following directions and creating a tornado of dirty dishes and congealed food all over the stove, counter, and in the sink. So to carefully focus on each step and avoid destroying my kitchen, I decided to take my time cooking the bacon first, the hollandaise sauce second, and the poached eggs last. Inevitably, I still proceeded to use just about every cooking tool in our kitchen to experiment with different techniques and created a giant mess of of broken egg shells, eggs with broken yolks, hollandaise sauce, bread crumbs, and avocado strewn all over the counter. Despite the extreme mess and lack of expertise, I produced an Eggs Benny that conquered Ty’s food prejudice and elicited multiple food-gasms. I got the deliciously rich hollandaise sauce recipe from Andrea, learned how to poach eggs from Smitten Kitchen, and bought a fresh multigrain loaf of bread from a bakery in Rondebosch. 1. Cook the bacon in a frying pan until lightly browned and set aside. 2. Melt the butter in the microwave for about 20 seconds and set aside to cool. In a small bowl, whisk together the egg yolks and slowly add the the water, lemon juice, salt, paprika, and butter until combined. pour the mixture into a small pan and whisk continuously for about 10 minutes on low heat until thickened. if you let the sauce sit, the egg will start to cook, so be careful. once the sauce has thickened, pour it into a bowl and set aside. 5. 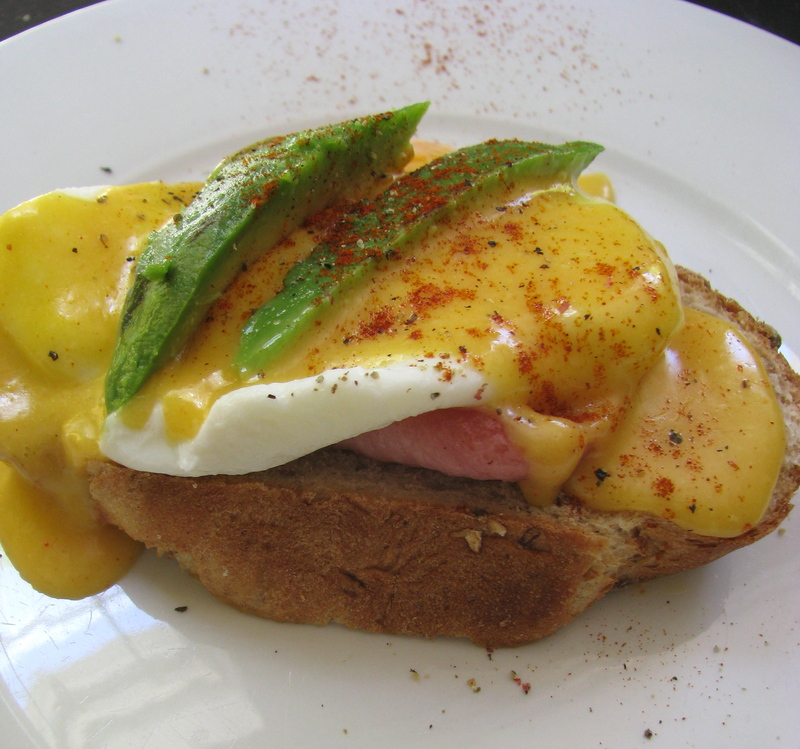 Place the bread on a plate and assemble the Eggs Benny by adding 2 strips of bacon, the poached egg, a generous pouring of hollandaise sauce, 2-4 slices of avo, and a dash of pepper and paprika on top. And enjoy!